These Bacon Blue Cheese Deviled Eggs are a bold change of pace. Don’t get me wrong: I love traditional deviled eggs, too. Who doesn’t? But that’s the problem. At potlucks, cookouts and parties, it seems like everyone brings a tray of them. Not long ago, I went to a party where six different people did! Meanwhile, I’d brought these. Guess which folks ate first? Note to self: check with the host next time to see if they know what everyone is bringing. Deviled Eggs have a retro vibe to them. So many of us remember eating them at grandma’s on Easter Sunday after our egg hunt was over, or Mom pulling out a special carrying tray of them on picnics. But did you know they are really retro — as in, dating back thousands of years? Ancient Romans loved deviled eggs, though they had a much different recipe. Nobles noshed on boiled eggs stuffed with things like oil, wine, and broth. They described feasts as lasting ab ova usque ad mala” — literally, from eggs to apples. Similar eggs continued appearing in different forms, stuffed with herbs or even raisins and cheese, over the next several centuries. But they weren’t actually called “Deviled Eggs” until 1786. Why Are They Called “Deviled”? Here in the States we call them “Deviled Eggs,” while our British kin use two Ls in the name. Maybe we should do it their way, because “devilling” food originated in Great Britain. At that point, to devil food meant adding spices to broiled or hot dishes. The French refer to them as “mimosa eggs” while in Hungary they say “casino eggs” to avoid the whole Devil thing. So, my Bacon and Blue Cheese Deviled Eggs may have an ancient lineage, but they’re definitely a modern variation on a classic. For one thing, I skipped the paprika. Then, I combined big chunks of smoky bacon and creamy blue cheese crumbles in the yolk mixture. A dash of hot sauce adds a hint of heat that brings it all together. Proper temperatures are critical for food safety. No one wants party guests to get salmonella. 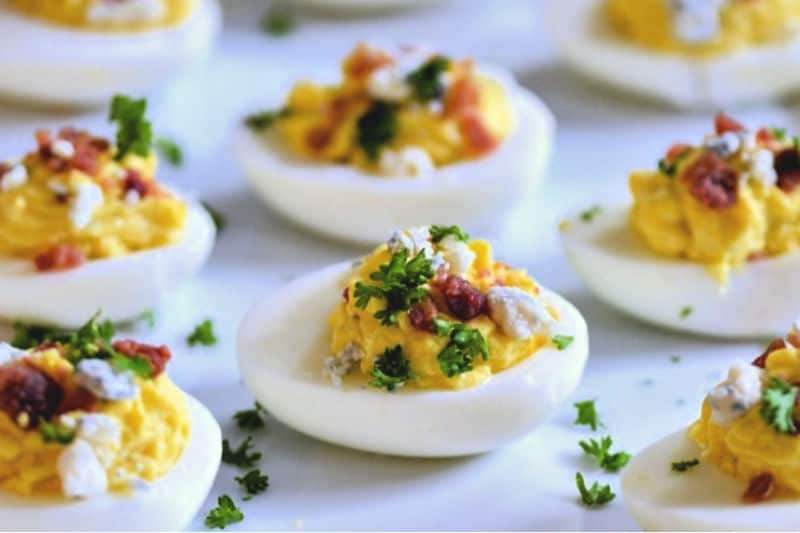 With recipes that use mayonnaise, like these Bacon Blue Cheese Deviled Eggs, it’s important to follow food safety measures. Use fully-cooked eggs. Soft, jammy egg yolks have their place, but that place is not in deviled eggs. So, cook your eggs until the yolks are solid. An easy way to do this by making hard “boiled” eggs in the oven or Instant Pot. Keep the ingredients chilled. Leave the mayo and blue cheese in the refrigerator while you’re cooking the eggs. Stick the hollowed egg whites in the fridge while making the yolk mixture. After you’ve stuffed the eggs, pop them back in the refrigerator until you’re ready to serve. Two hours at room temperature, tops. Use a cooler to transport the Bacon Blue Cheese Deviled Eggs if you’re traveling. Don’t leave them at room temperature longer than two hours — one hour if you’re serving the outside on a hot day. How Long Do Deviled Eggs Last in the Fridge? If you’re eating low-carb or following a Keto diet, it’s always high-protein snacks ready to grab when a craving hits. Even if you’re not on a special diet, they’re a quick and delicious treat to have on hand. You do need to eat them within a week, though, so adjust the recipe size according to your needs. 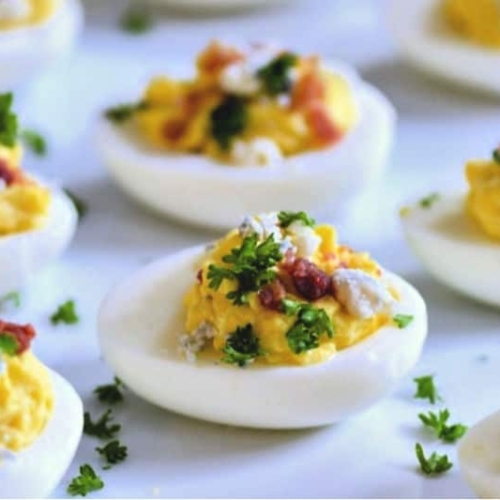 If you’re bringing leftovers home from a party — and I have never had leftover Bacon and Blue Cheese Deviled Eggs — shorten that time to two days. Studded with smoky bacon and creamy bits of blue cheese, this modern twist on deviled eggs is a flavorful appetizer that’s always one of the first to go at parties, potlucks, and picnics. Slice the eggs in half lengthwise. Scoop the yolks into the bowl of a food processor. Arrange the whites on a platter and refrigerate. Add all but 1 tablespoon of the blue cheese, all but 1 tablespoon of the bacon, 1/2 cup of mayonnaise, hot sauce, white vinegar, and 2 grinds of black pepper to the food processor. Process until creamy, adding additional mayonnaise as needed. Stuff or pipe the filling into the egg whites. Refrigerate at least 30 minutes. Sprinkle with remaining blue cheese, bacon, and minced parsley before serving. 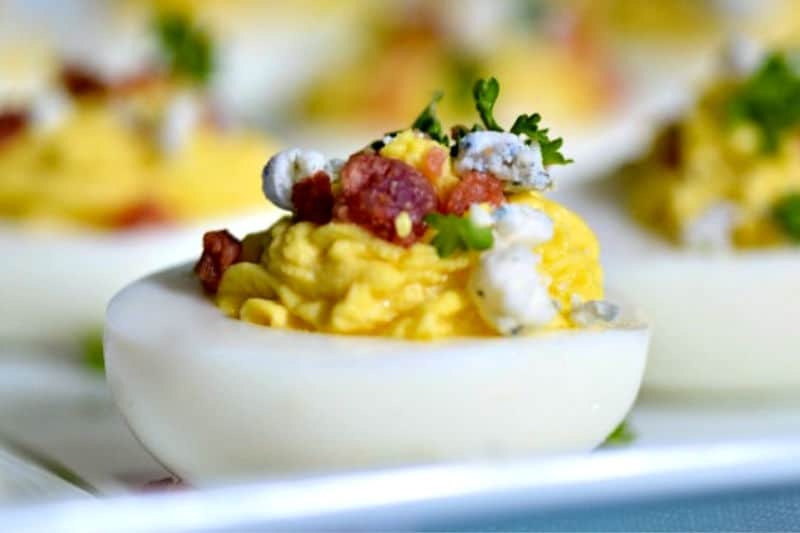 Keep Bacon Blue Cheese Deviled Eggs refrigerated until ready to serve. Do not leave at room temperature more than 2 hours, or 1 hour if serving outdoors on a hot day. Nutritional information is provided as a courtesy. If you have specific dietary needs, you should calculate the values yourself. 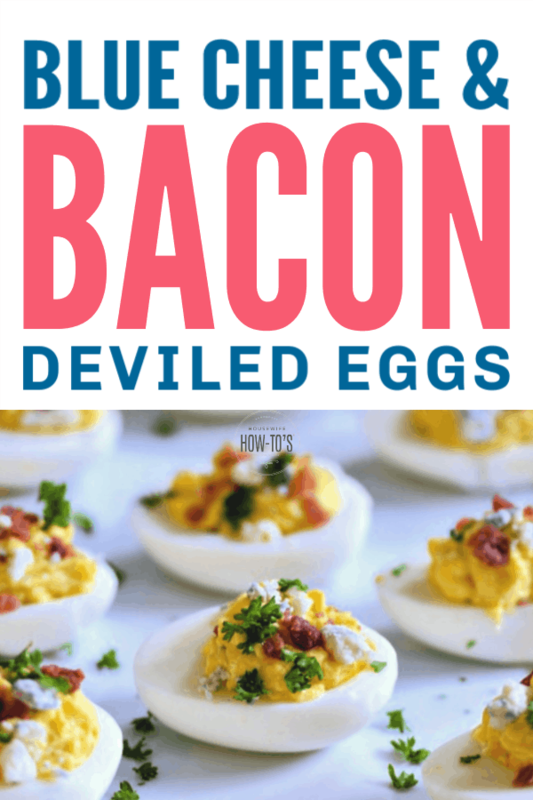 Pin this Bacon Blue Cheese Deviled Eggs Recipe for later! Oh, my! I’ll have to try these, and soon!